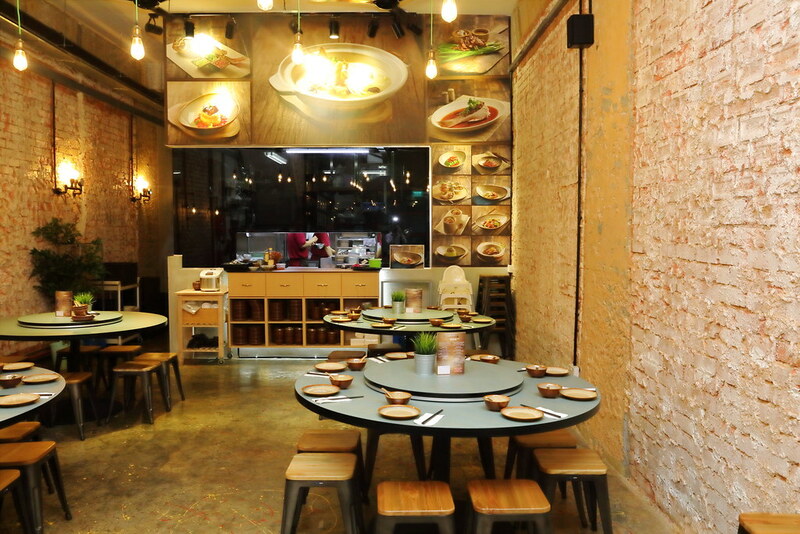 Newly opened in Lavender is The Chinese Kitchen (厨神私房菜), opened by local renowned Chef Austen Ong, the former president of society of Chinese cuisine Chef (Singapore). He is also dubbed the 厨神 (God of the Kitchen) by the culinary industry, probably from his numerous achievement such as winning the Gold medalist of Asian Cuisine in the 8th FHA International Salon Culinaire, Most Creative award in the 4th World Championship of Chinese Cuisine and Champion of Taipei's World Culinary Contest in both 2005 and 2007. We started with some light bites for our dinner. 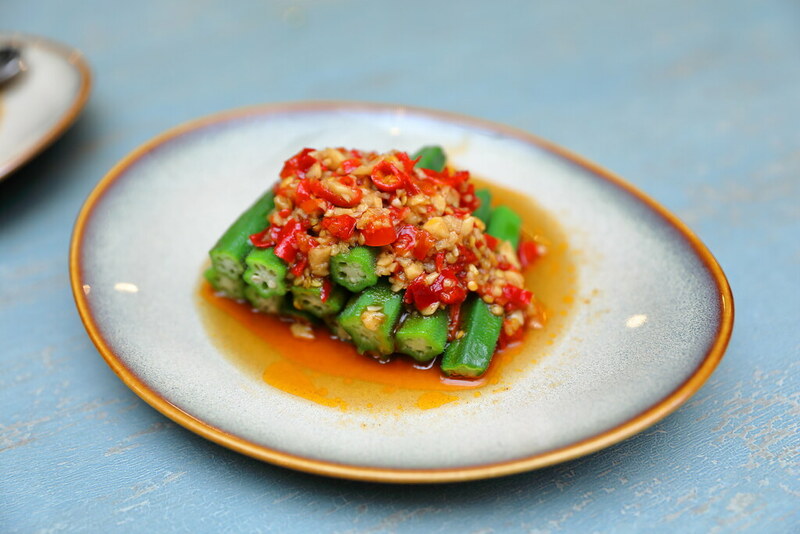 First, we tried the Organic Okra with Pickle Chilli ($6). The okra or ladyfinger has a nice crunchy texture without that slimy texture. The star of the dish is actually the pickle chilli, it complemented the okra excellently. The pickle chilli is so good that I could not resist pairing it with other ingredients. Given a touch of exquisite to a traditional dish is the Pork Trotter Jelly with Passion Fruit Infused Cucumber ($8). A Teochew delicacy which is not commonly available on the restaurant's menu due to the painstaking process of making it. 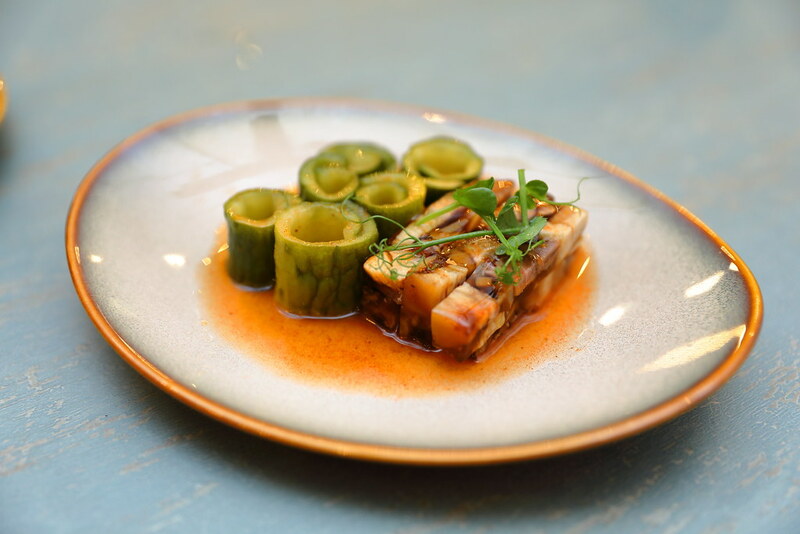 The pork trotter jelly encased in a soft gelatine cubes with savoury pork shreds is accompanied with crisp chilled cucumber slice. From the description of the dish, I thought the "Ma La" Baby Squids and Eryngii Mushroom ($9) would be very spicy but it turned out rather sweet. 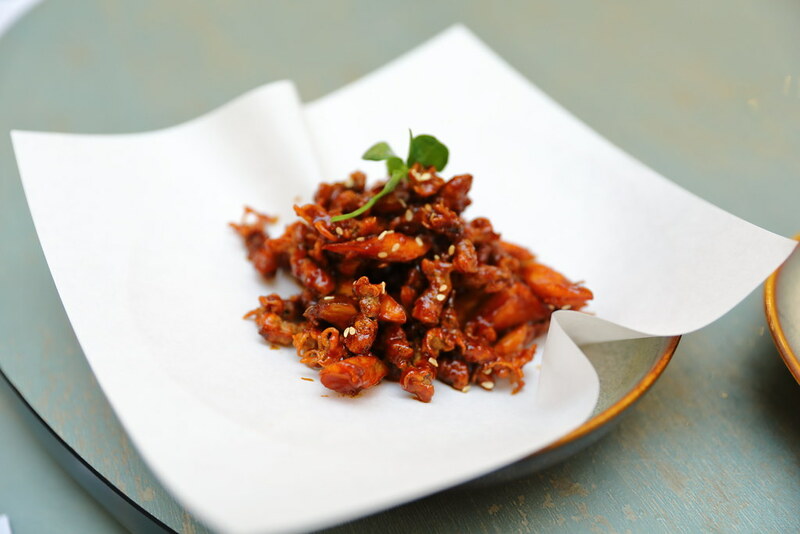 Putting that aside, the deep fried baby squid is very crispy and the eryngii mushroom provides the additional crunch for a multi-textural enjoyment. I was wondering why the next dish is named Signature Old Fifty Collagen Broth with Ocean Catch ($38 for 2-3pax/ $55 for 4-6pax)? It was explained that the broth is using the cooking style of the 50s, in which the pot of soup is simmered over charcoal for 10 hours. 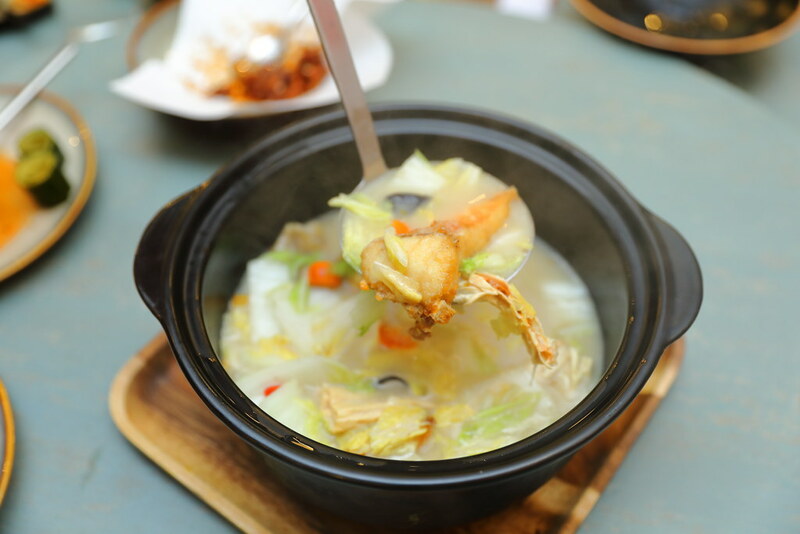 The collagen rich broth is a result of cooking the soup base with chicken, duck, pork and fish skin. Diners can choice from 3 different types of fishes - Ocean Catch, Wild Caught and Snapper. Not only that, you can have the soup in its original flavour, miso or spicy. This is definitely one of the best order dish here. Not commonly used in modern Chinese cuisine is charcoal grilling. 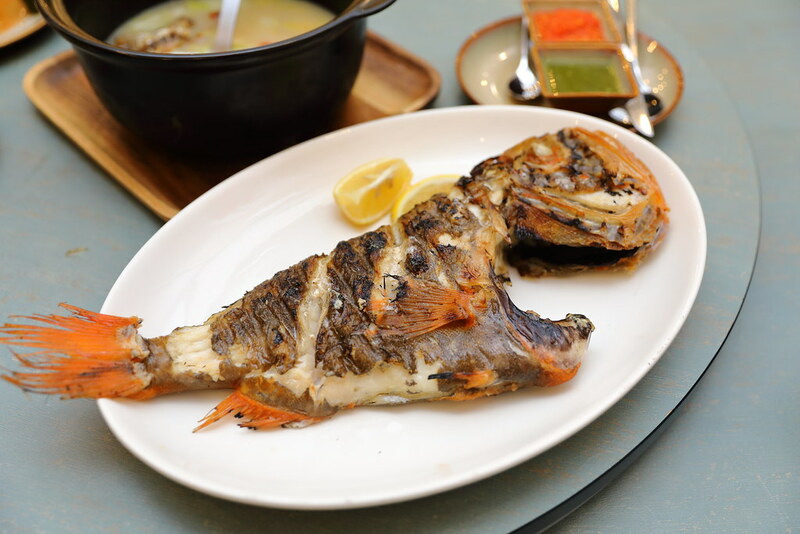 One of such dishes on the menu is the Charcoal Grilled Orange Sea Perch with Sea Salt & Spices ($58). I like how the grilling manages to locked in the moisture and succulent meat. The fish meat is best pair with the unique blend of sauces that brings out its freshness. 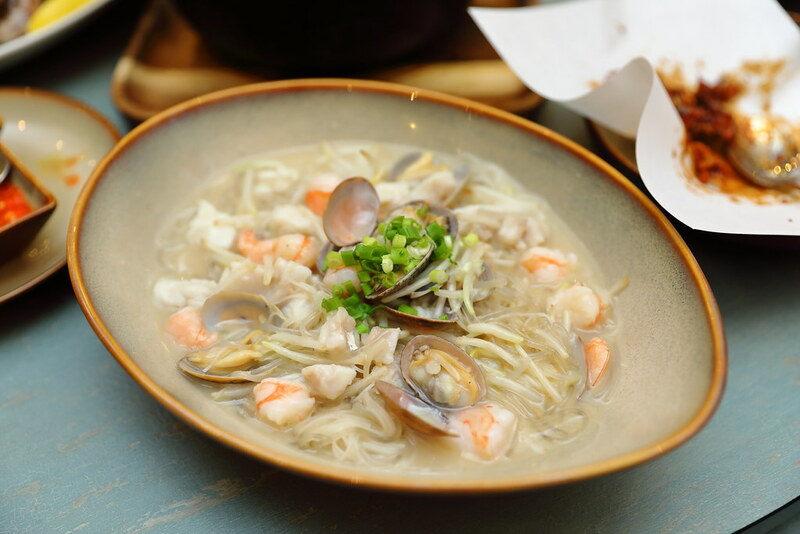 The Braised La La "Ying Yang" Noodle ($14) is another interesting item on the menu whereby Chef Austen uses two different type of noodles - beehoon and dangmyeon, giving the dish a contrasting textures, soaking up the sweet broth from the seafood. However, the kitchen was a bit heavy with the salt during my visit. 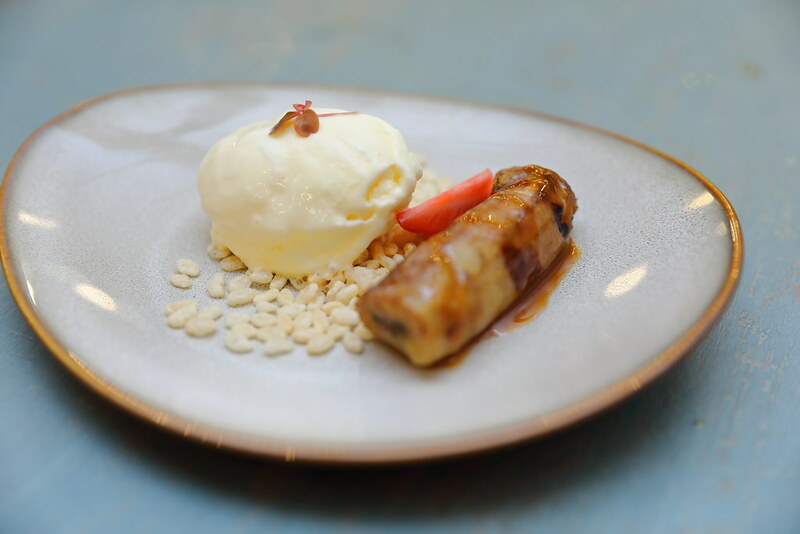 For dessert, is another item from the charcoal grill, Charcoal Grilled Banana, Sea Salt, Caramel, Ice Cream ($4.50). The different components on the plate seems rather isolated but when you have them together, a pleasant harmony sings in the mouth. 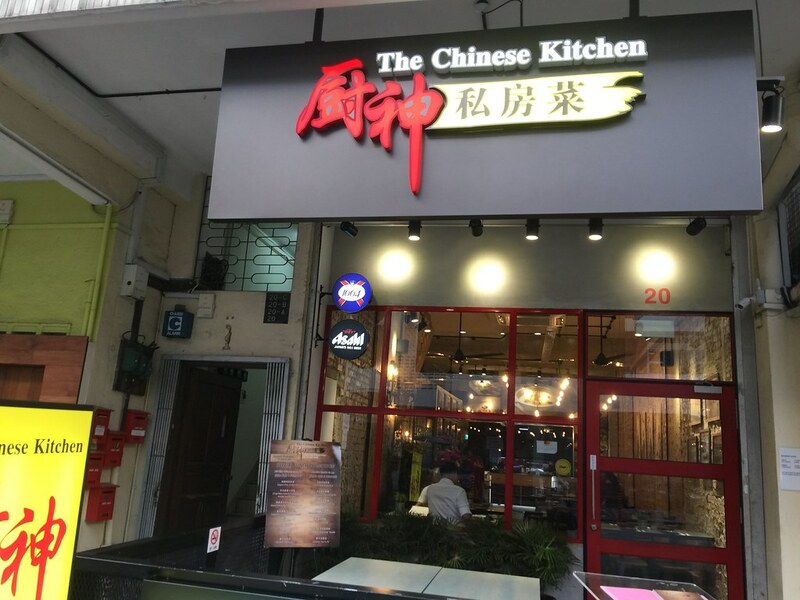 After trying the food by Chef Austen, my takeaway is that he has given a touch of fineness to dishes tat is close to our heart, without losing its roots of traditional Chinese cuisine. More importantly, the pricing is very reasonable.